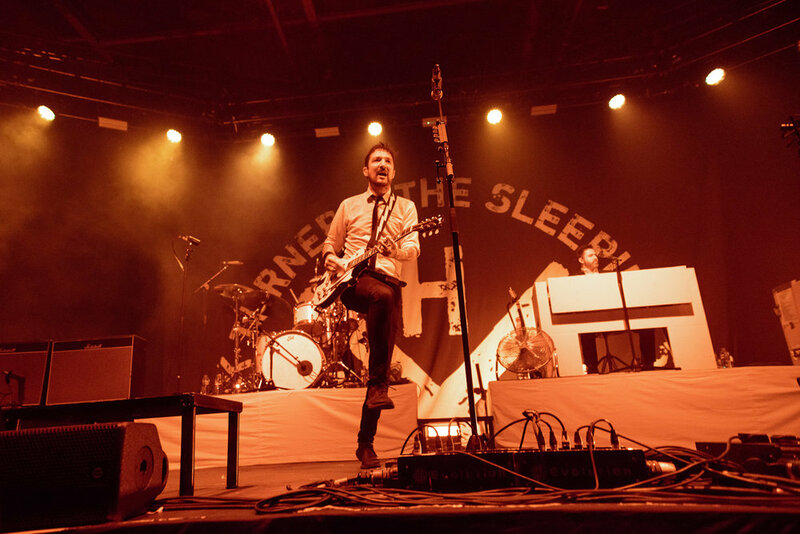 Frank Turner and The Sleeping Souls brought fire, fireworks and a whole lot of fun to their energetic show in Manchester, playing two sold out shows at the O2 Victoria Warehouse. The 3500 capacity venue is located on the edge of Trafford Park, the worlds first industrial estate, but the unique warehouse is definitely worth travelling out of the city centre for. Used for everything from weddings to corporate events, the venue itself is gritty and dingy but has a real authentic gig feel to it. Victoria Warehouse is pulling in more and more huge acts each month, the vast space certainly makes a fascinating gig venue. Support came from two seemingly contrasting artists, although the genres complemented eachother. Just as I had finished admiring the industrial decor of the venue, first support Grace Petrie, a folk singer-songwriter from Leicester, took to the stage. Tackling issues of gender stereotypes, LGBTQ and politics, her songs are powerful singalong rants protesting current topics. Although first on the bill, Grace Petrie drew in a large crowd for her set, which was short but made a lasting impression. Recent single ‘Black Tie’, one of the most poignant songs on the latest album ‘Queer as Folk’, was played amongst ‘Pride’ and some other album tracks. Next on the bill were Jimmy Eat World, a band who have been going longer than I have been alive, but they proved to still have it! Although the set was shorter than we had hoped, we managed to hear a concise ‘best of’ version of their whole back catalogue. The setlist finished on fan favourites ‘Bleed American’, ‘Sweetness’ and ‘The Middle’, which was a nostalgia trip for many of the crowd, who were singing back lyrics with passion. Singer Jim Adkins said “We are Jimmy Eat World, Frank Turner is up next” before going into final song ‘The Middle’ as the room suddenly filled with phone screens recording a glimpse of the bands breakthrough single. Jimmy Eat World are celebrating 25 years as a band this summer. With the venue now full to the capacity and the crowd all fired up, luckily it wasn’t long before Frank Turner took to the stage. Playing a small acoustic gig at the Hat Museum in Stockport before the previous Manchester date and a Youth Centre in Bolton before this show, Frank Turner is famous for numbering his shows. This was his 2303rd gig, with him addressing it later in the set, it made us feel like it mattered to him and this wasn’t just another show. Opening with one of his heavier songs ‘Out of Breath’ and following up with ‘Recovery’, it quickly became evident that this energetic live show was going to be a memorable one. 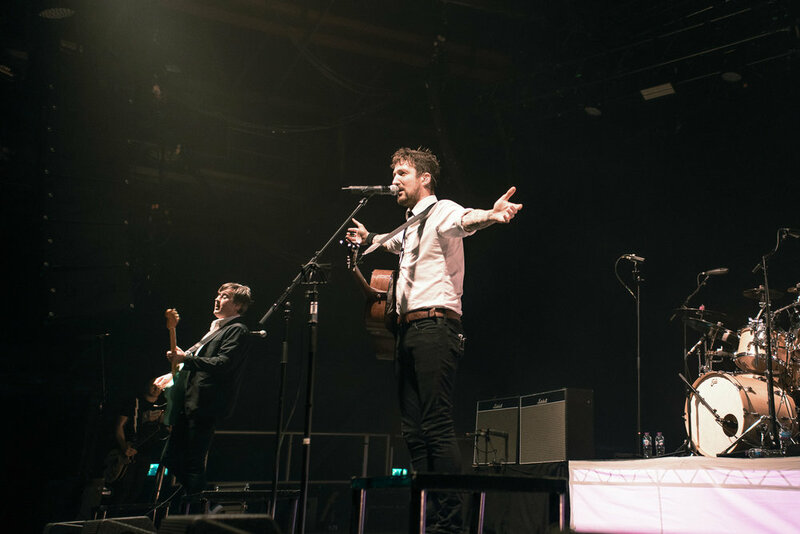 It wasn’t long before the silence was broken inbetween songs, “Manchester is always the first to sell out - and we did it twice!” Frank Turner is an incredibly humble character, the whitty comments continued as a mix of singles and album tracks were played. Touring in support of latest album ‘Be More Kind’, the setlist heavily featured new songs and it was evident that fans had already learnt the lyrics to the tracks! “You guys know by now that I can’t dance – I’ve always been a fan of a dance move that doesn’t require any coordination”. The video for ‘Little Changes’ projected onto the backdrop, adding to the visual aspect, as the feel good track was performed fans were singing and dancing along. Halfway through the set The Sleeping Souls left the stage in order for Frank Turner to play some acoustic songs. ‘Substitute’, ‘The Absent Friends’ and ‘Glorius You’ had the venue feeling like a festival, phones were lighting up the room whilst the crowd were swaying in response. I felt a sense of unity and for those couple of hours spent under Frank Turners watch we were all equal. Although jam packed, this was one of the nicest crowds I’ve ever been in. “Ladies and gentlemen would you welcome back to the stage The Sleeping Souls” as the band came back to the stage we saw more fire and projected visuals to accompany the final songs. After a rendition of 2010 single ‘I Still Believe’ the whole band left the stage to huge applause for an encore. 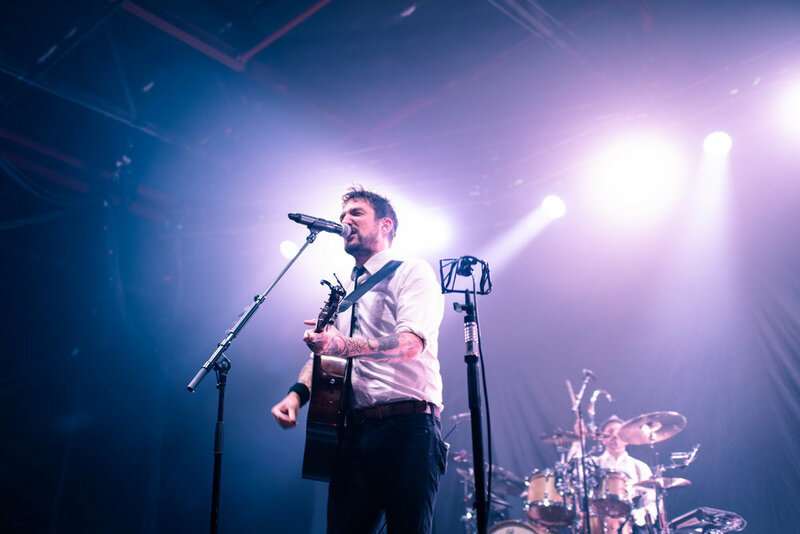 The four song encore was lead by ‘Be More Kind’, which saw Frank Turner singing solo under a purple spotlight with phone lights swaying in the air. 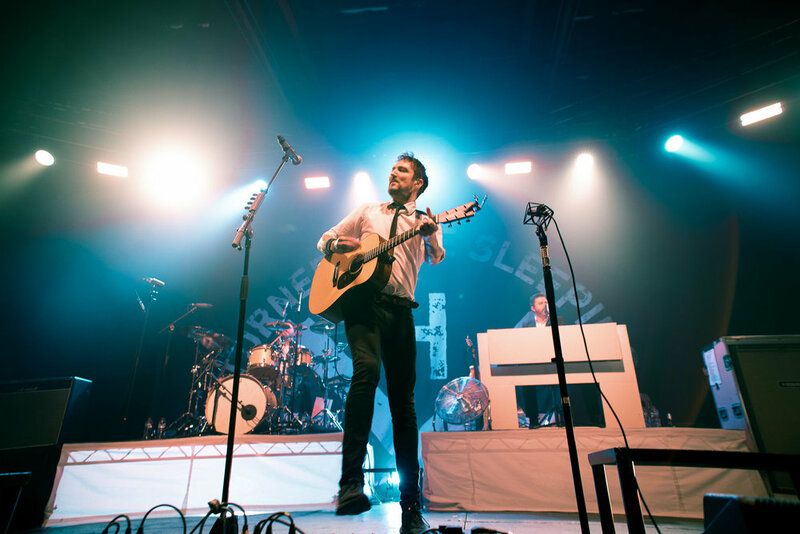 ‘The Way I Tend To Be’ and ‘Get Better’ followed, as the set came to a close, the final song ‘Four Simple Words’ saw confetti canons and Frank Turner jumping into the crowd. Right from the get go, Frank Turner was full of energy and I didn’t expect anything less. In fact, I was quite blown away by the live performance aspect, Frank Turner is one of a kind and really proves he is a frontman, as opposed to a man with an acoustic guitar. Who would have thought a solo folk-rock singer could bring fire and confetti canons to so many sold out shows? If there is a message to take away from this gig, it’s to be more kind. “Be more kind my friends, try to be more kind”.